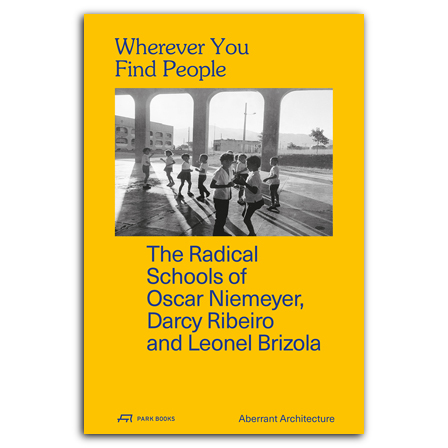 Wherever You Find People tells the unusual story of the Integrated Centres of Public Education (CIEP), a radical but relatively unstudied public architecture initiative in Rio de Janeiro in 1982. Conceived by the world-renowned architect Oscar Niemeyer, the intellectual and politican Darcy Ribeiro, and state governor Leonel Brizola, the program addressed the massive urban migration that Rio de Janeiro was experiencing at that time, which spurred demand for new schools. As a result of the experimental program, over five hundred CIEP schools were built using a standardized system of simple concrete parts. Based upon extensive interviews with key people associated with the project past and present, including Architect Jair Valera, Niemeyer’s primary collaborator, and Claudia Costin, the Rio city secretary of education, Wherever You Find People tells the story of this unprecedented project. Alongside candid conversations, the book features never-before-seen photography and drawings, as well as essays that examine the CIEP’s story as a guide to how architecture can embrace the constraints and conditions of the modern world. The result is a vivid documentation of a unique but relatively unknown piece of socially driven public architecture, with valuable lessons for the future. Contributions by Shumi Bose, David Chambers, Alastair Donald, Kevin Haley, and Ligia Nobre. Conversations with Laurinda Barbosa and Carmen Rangel, Washington Fajardo, Ricardo Hennriques, Carlos Niemeyer, Lauro Cavalcanti, Jair Valera, Carmen Silva Barretto and Fernando Balata, Renata Carneiro, Leonardo Peixoto and Silvestre, Lenita Vilela, Carlos Eduardo, and Claudia Costin and Rafael Parente. Reprinted texts by Leonel Brizola, Oscar Niemeyer, Darcy Ribeiro, and José Carlos Süssekind. Foreword by Vicky Richardson, postscript by Beatrice Galilee. is a director and co-founder of Aberrant Architecture. He has done his architectural education at the University of Bath, Delft University of Technology, and London’s Royal College of Art. is Prgram Manager for Architecture at the British Council and an associate director of the Future Cities Project. is a director and co-founder of Aberrant Architecture. He studied interior design at London's Ravensbourne College and architecture at the Royal College of Art. is a São Paulo-based architect, researcher and curator.